"A very hearty, flavorful soup. Use whatever small shaped pasta you like." Stir water, tomatoes, beef broth, and Italian seasoning together in a large pot; bring to a boil. Add meatballs, Italian-blend vegetables, and pasta to the pot. Return broth to a boil, reduce heat to medium-low, and cook until the meatballs are heated through and the pasta is tender, about 10 minutes. 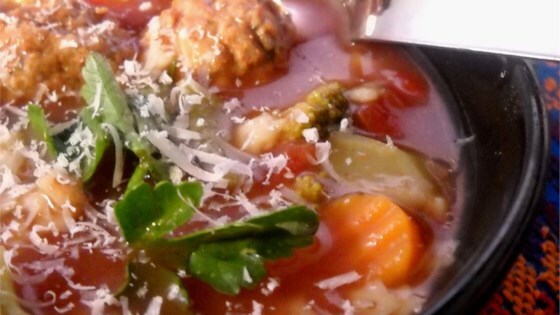 Ladle soup into bowls and garnish with Parmesan cheese.